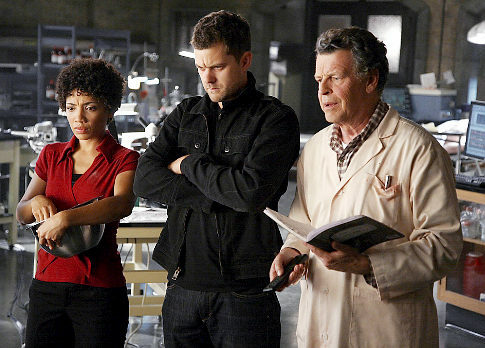 On a recent marathon work day, surrounded by "victims" encased in amber for an upcoming episode of Fox's "Fringe," actor Joshua Jackson was reminded of why he's a huge fan of his own sci-fi series. "Is someone snoring in the amber? I get those moments a lot where I go, 'God, I love this show,'" says the 32-year-old actor. "It's just so far out there." It is so far out there, and as the critically praised sci-fi show returns Friday at 9, that's been a problem. Producers are trying to figure out what to do to save "Fringe" amid a gradual ratings decline, and the move to Fridays doesn't help. It's a day where serialized dramas have gone to die. "If you put a gun to my head, I couldn't explain to you why the viewership has gone down from last year when all the pieces remain the same. It's a mystery to me," says Jackson. But fans are watching the show; they're just doing it on their DVR and on their iPhones. "We're almost at the point where the classic national television model doesn't exist for young people anymore," says Jackson. "The future is already here." Unfortunately, if those fans don't tune in on time on Fridays to factor into the more traditional ratings system, the future may come too late to save "Fringe." A show about shape-shifting hit men and alternative universes, all of which orbit around the relationships between FBI agent Olivia Dunham (Anna Torv), Jackson's Peter Bishop and Peter's eccentric genius father, Walter (John Noble), it boasts a rich back-story that may be too dense for beginners. So it's up to the fans. Nobody is rooting harder for the series to succeed than Fox Entertainment President Kevin Reilly. "It's a fantastic show, and honestly, I'd be heartbroken if it went away," he recently told reporters. There have been cases where loyal fans have been able to save their favorite show. When CBS canceled the postapocalyptic series "Jericho" mid-cliffhanger, the network was deluged with shipments of peanuts - an allusion to a line from the show. The result? A stay of execution to finish the story line. "The show's basic core audience would watch 'Fringe' in a swamp on a Friday night if that's what they had to do," says Prof. Robert Thompson, founder of the Bleier Center for Television and Popular Culture at Syracuse University. "[But] the places that air these shows don't sell enthusiasm; they sell ratings points." Jackson believes the producers do have an emergency plan to wrap up the series' story line at the end of this season. But it would be a shame to end the ride when the show is hitting its creative stride. "It's not that not enough people are watching 'Fringe,' it's that not enough people are watching 'Fringe' during the hour that it's on the air, which is key for the network," says Jackson. "You don't have to go to school the next morning. You can always go out drinking an hour later." The show is awesome. Who cares about ratings, ya'll should do the show for me. Fringe is the best show to ever hit TV. I'm praying the show will stay on for year's to come. Just remember; those are the Neilsen Ratings; about as accurate as a blind man judging a dance contest. So if everybody knows, including Fox executives, that lots of people watch the show on DVR, on-line, etc, etc... why it the stupid Nielsen ratings system still in use???? The rating are down because last season shows sucked. The hole bit of going back and forth between universes was not interesting at all. They need to get back to the original concept of examining the strange and unexplained. Please FOX, just one more season after this wouldn't be too much to ask for? Time to bring the pre-historic Neilsen's into the 21st century. They are an antiquated system that is way behind the rapid evolution of the modern TV age...and that goes for the networks too. The powers at Fringe should start shopping their fine product around to better outlets. Don't give up guys. Or a better idea is for them to fix how they look at a shows viewings. I dont see how its so hard. Surely hulu can provide a view count. They have the count for views on their own site (you can watch at fox.com cant you?). They have the normal view count. And im not sure why dvr doesnt count as a normal view, its acting as a user viewing the show, i dont know how they gather the stats. We are in an annoying phase. The internet is here to stay, its been here for a long time already. Isnt it time you begin factoring it in. Once they do that series that have a good following will stick around, but until THE NETWORK changes we will keep having good shows die off. The networks should be the first ones to realize that entertainment has changed. The new generations are becoming more and more disconnected to the tv and more connected to their computers and iphones, however good quality products will always have their place. That's what the big executives, looking at their numbers and nothing else need to realize. Who cares which platoform people use to see it?! It's about damn time they figure out a way to adapt to the new era. Also the actors are doing great.